It’s just too hot to go outside and I’ve run out of books to read. My Amazon order doesn’t arrive until next week so in the meantime, I’ve been skimming through cookbooks again, trying to find new recipes I haven’t tried or just get inspiration for dinner. Today, I decided to do some scones from the Short Order section of Donna Hay’s Modern Classics Book 2. The recipe only had 4 ingredients, all of which I had – flour, baking powder, sugar and single cream. It took 10 minutes to make and 15 minutes to bake so in about half an hour I had a cup of Earl Grey and some scones with strawberry jam and cream for tea. Whisk 2 1/2 cups of single cream until soft peaks form. Sift over 3 cups plain all-purpose flour and 3 Tbsp. baking powder. Add 2 Tbsp. caster (superfine) sugar and stir to combine. Turn onto a lightly floured surface and press out the dough until 3 cm. (1 inch) thick. Cut into 4 cm. (1 1/2 inch) rounds, place on a baking tray lined with non-stick baking paper and brush the tops with a little milk. 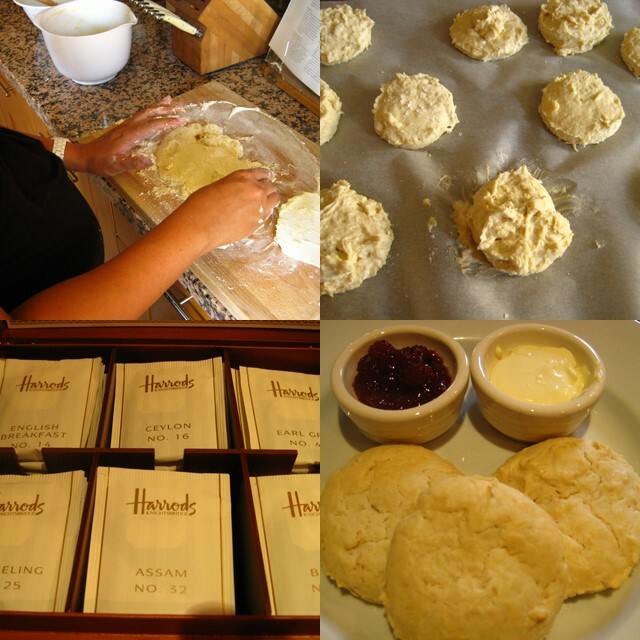 Bake for 12 to 15 minutes or until scones are puffed and golden. Serve warm with jam (jelly) and cream.